A true 'club' with strong membership, mostly British. Staff at check-in/starter typically helpful and polite. The holes are varied, scenic and interesting. Off the yellow tees this is not a difficult course at all so good for handicappers 25+, pretty tame for handicaps up to 15 e.g. hitting maximum 8-iron as 2nd shot to the green on every par 4. Off the blue tees it is much better proposition for low/medium handicappers. This is a soft golf course - always well-watered and in good condition. Tee boxes are excellent. Greens medium-sized and medium-paced with enough slope to be a challenge. Fairways have good quality grass, generous width. Wide shots not too often in deep trouble. There are 4 large ponds in play on 4 holes and a stream runs through the course, but overall the water hazards are not a big problem. Members – like any club with lots of active members – can be a bit snooty towards guest players, but this is not a big deal in my view. Course quite steep elevations up/down the valley so not easy to walk or play until you know the layout. The course winds up the valley to the 10th hole at the top of the valley, then back down the valley again. Take a buggy the first time you play it. By default, buggies are not allowed on fairways. But the blue flags (supposedly for handicapped players allowing them to take buggies on the fairways) is widely misused by members, resulting in blue-flagged buggies all over the fairways. The Santa Maria clubhouse is medium-sized, sociable and pleasant. In short, a well-run not-too-big club that is hospitable towards casual golfers provided you are polite and reasonable to start with. 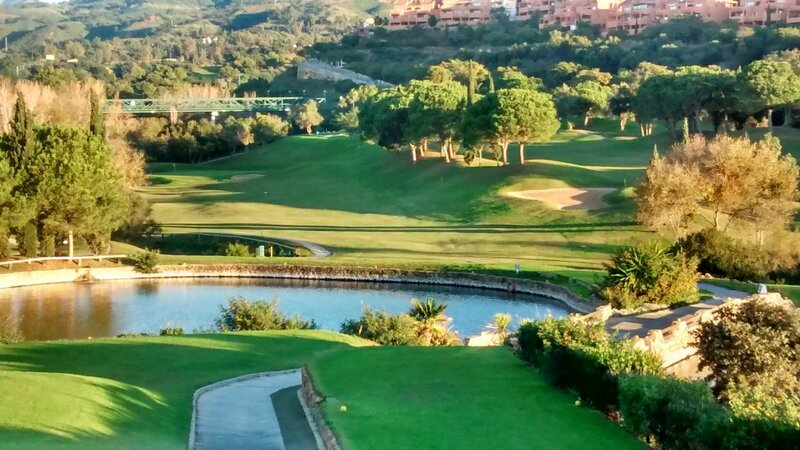 For both foreigners and local Spanish people, Santa Maria is a nice, convenient golf club that is a good choice for most of their games without costing a great deal. A default course for me. I play it regularly and almost always have a pleasant relaxed round. Course has quite a variety of handicappers playing it, so you might be stuck behind slow golfers. But that is just life. The type of course and central location means it will always have reasonably strong membership, so casual visitors are welcome but not essential. 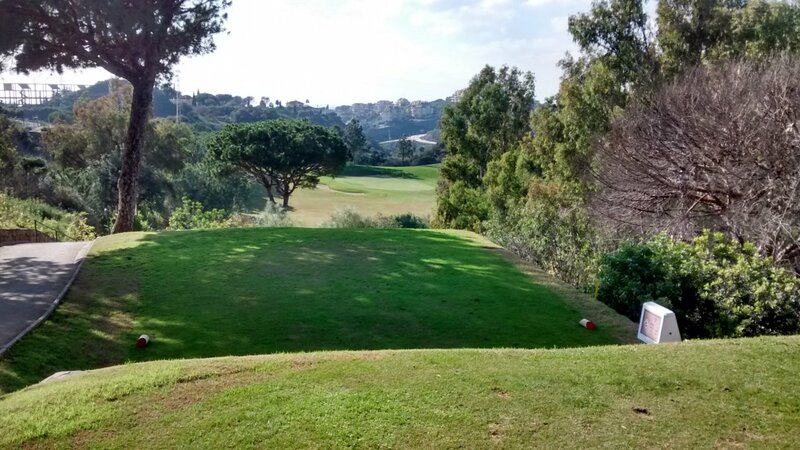 I recommend Santa Maria to all levels of golfers, although very low-handicap players off easy tees might find it a bit tame. Generally good value-for-money, although the peak season prices (March through May) are notably higher than prices during the remainder of the year. Review last updated: July 2015. Number of times played: 20+. Santa Maria is represented by the yellow dot. 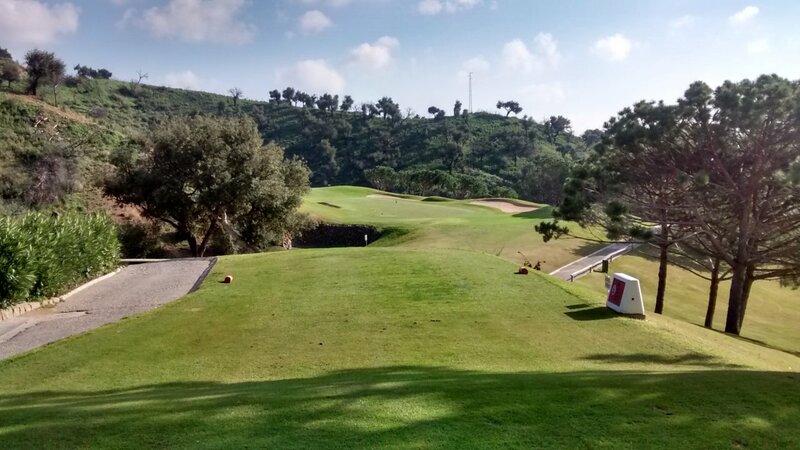 This shows that this course is in 'bottom 10' on length when compared to all other courses on the Costa del Sol, and is less than average difficulty. A short, quite easy course. An 18-handicap player can expect to go around this course in 19 over par.